The 2015 Spring Meeting of the AAVSO was held June 4-6 at Ball State University in Muncie, IN. 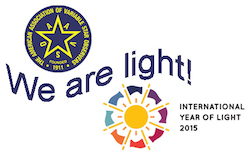 As many of you may know, 2015 is the International Year of Light. The meeting theme, "We are light!" celebrated the AAVSO's century-long commitment to the study of the variable light of the night sky. This was Stella Kafka's first AAVSO meeting as Director of the Association. Many thanks to the attendees who made this a wonderful meeting! - Be a Corporate Sponsor/Vendor! - Videos are available for Bill Goff's Treasurer's Report and Stella's first Director's Report! - Click here for the group photo! - Click here for conference maps. - A note about parking on campus: We strongly recommend you use the free shuttle bus service that will operate between the hotels and the BSU campus. If you must use your car, you will find that legal parking on campus is scarce Monday through Fridays. On Saturday the lot (R11) adjacent to the planetarium is open and unrestricted, but the number of parking spaces is limited. Never park in a handicap space (without proper car ID) and never in a space designated “special parking.” The Universty will tow unauthorized vehicles in these spaces. - Schedule has been updated. Click here to view an updated schedule including paper order. - About Muncie and Restaurant List. - Attendee list: Click here for an updated list of attendees. At the end of Stella’s talk we will offer a 10-minute planetarium program for anyone that wants to stay. Also, Bob Berrington will be operating the SARA telescope in Chile. Visitors are welcome to drop by and have a look. Opening Dessert Meet & Greet: We will be holding an informal gathering at 8pm Thursday evening featuring ice cream, cookies, fruit, and fellowship. All attendees are invited to stop by, register, drop off presentations for talks, and say hello. This will be an excellent opportunity to connect with old friends and to welcome our new members and first-time meeting attendees. Paper Sessions: We are light! Keeping with our meeting theme, papers on any topic dealing with the variable light from the night sky or the sun will be presented in sessions held on Friday and Saturday. Posters will also be presented on Saturday. Planetarium Show: Our host at Ball State University, Dr. Ron Kaitchuck, is also the Director of Ball State's Charles W Brown Planetarium, which opened to the public in November 2014. A planetarium show will be a part of our program, so that we can see this state of the art facility in action! Currently the show is scheduled for Friday at the conclusion of the afternoon paper session. Membership Meeting: All attendees are invited to this gathering, which will be held Saturday morning. The purpose of this meeting is to inform attendees of the activities of the Association. The Treasurer's and Director’s Reports will be included. All portions of the membership meeting will be broadcast online at no charge via GoToWebinar. (Details will be announced on the website.) We will leave plenty of time for Q&A and will be taking questions from both in-person and online attendees. Closing Award Banquet: We will hold our closing awards banquet on the Ball State University campus. Sleeping rooms for AAVSO meeting attendees have been reserved both at the Muncie Holiday Inn Express and the Muncie Hampton Inn. (The properties are across the street from each other.) We have secured a special group rate of $109 plus tax. Both hotels include breakfast in this rate. Please make your reservations by calling the hotel no later than May 3, 2015, and be sure to mention that you will be participating in the AAVSO meeting when making room reservations. Roommate matching assistance will be available for those who would like to lower costs by sharing a room - just complete the appropriate section of the registration form once available. Attendees have the option of renting a car and driving to Muncie. This is a 60 to 90 minute drive. The Hoosier Ride bus company provides bus service between Indianapolis Airport and Ball State University Campus in Muncie. A taxi can be called for the short, 10 min ride to the hotels. Please note: The bus runs only a couple of times a day, so you might want to keep this in mind when deciding on flight times. Transportation will be provided between the Hampton Inn/Holiday Inn Express and the Ball State University campus on Friday and Saturday, both for the paper sessions and the banquet Saturday evening. NEW THIS YEAR!! For the very first time the AAVSO will be offering a full online meeting attendance option. In the past we have broadcast the Saturday morning membership meeting to our members free of charge. We will continue to do this, but we will add the option of registering for the meeting as an online attendee and virtually attending all paper sessions. We will be using a webinar service to broadcast the meeting. Video will consist primarily of the presenter's PowerPoint presentation with occasional webcam shots. We will also give attendees access to recordings of each session for a limited time after the meeting. We are happy to expand the possibilities of meeting attendance to more of our members, observers, and friends. Students: Educators bringing students to the meeting or groups of students attending are welcome to use the family rate to register up to 4 individuals. Educators with larger groups or students who would like to attend on their own should contact us for more information on possible student discounts and scholarships. The early abstract submission deadline is May 8, 2015. After that, late abstracts will be accepted on a space-available basis until May 15, 2015. You may complete the abstract submission form online via the 104th Spring Meeting Operations page (strongly preferred) or you can call the AAVSO (617-354-0484) to request that a paper copy of the abstract form be mailed to you. NOTE: The abstract form will not appear until you have registered for the meeting. Please note: We will have a limited amount of time to accommodate oral presentations. If we are unable to schedule your paper as an oral presentation, you will be informed by May 18, 2015 and you will be welcome to present your work as a poster paper. Would you like to give your business a boost by having a presence to the AAVSO Spring Meeting? Multiple levels of participation are be offered, so you're sure to find the right fit for needs. Download the Sponsorship Application for more information or contact us with any questions.